While the challenges today may be greater, the climate movement need only look to its own recent regrouping and shifting of strategies for a path forward. The climate movement woke on Nov. 9 to a new reality few of us had expected to be faced with: the specter of a Trump presidency and perhaps the most anti-environment administration and Congress in U.S. history. Suddenly our job of stopping new oil pipelines and fracking wells, preventing the construction of fossil fuel plants and shutting down existing fossil fuel infrastructure felt much harder. What the polls failed to account for was unexpectedly low voter turnout, caused in part by voter disaffection with both presidential candidates and a growing nationwide frustration with the existing political system. Despite Clinton winning the popular vote, low progressive turnout in key swing states granted Trump enough Electoral College votes to claim the presidency. If there is any silver lining from the Trump victory, it would seem to be the evidence that vast numbers of people are hungry for a radical shift in politics. But Trump wants to take us in the opposite direction of progress on climate change. During his campaign, he pledged to scrap the Paris climate deal and the Obama administration’s Clean Power Plan. He promised to re-start approval of the Keystone XL pipeline and resurrect a dying coal industry. And his suite of potential cabinet nominees include climate science deniers and oil drilling proponents. To many activists, the coming Trump presidency calls to mind the darkest days of the George W. Bush administration, when fossil fuel industries were basically invited to write national policy. But much has changed in the U.S. climate movement since the days of Bush. The last six years have seen the birth of climate campaigns that are bigger, bolder and more direct-action oriented than any environmental movement in decades. Although this recent movement growth occurred during the Obama administration, its origins can be traced to a time when the climate movement was reeling from a series of shocking defeats. Obama’s campaign promises in 2008 had caused mainstream environmental groups to welcome his administration with the expectation of unprecedented progress. But this dream soon faded. In the early years of the Obama administration, climate change took a backseat to other issues and was not a major priority. In late 2009, the Copenhagen climate talks collapsed, and the following year saw the dissolution of national climate legislation. Even the weak, watered-down climate bill that eventually failed to pass Congress never received the kind of focused support from Obama that health care had. Not only that, Obama was opening vast new areas of land and water to oil and gas drilling. By mid-2010, the prospects for meaningful climate action at the federal level looked increasingly bleak. In the years that followed, both mainstream and radical climate groups began focusing on directly challenging fossil fuel companies and key pieces of their infrastructure. The Sierra Club recruited thousands of people to attend hearings on coal export projects. Activists from coast to coast blockaded fracking rigs and sat down in front of coal and oil trains. And a nationwide divestment campaign began diverting billions of dollars out of fossil fuel company stocks. The result was a new kind of climate movement, less focused on lobbying than on street protests. And slowly, this movement began winning. 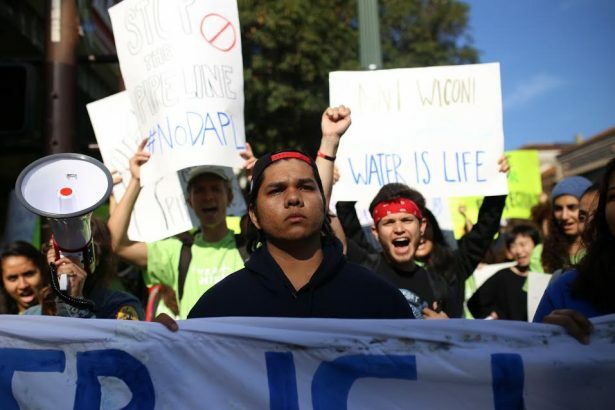 Perhaps its greatest moment was the defeat of the Keystone XL pipeline in 2015, after thousands participated in acts of civil disobedience and tens of thousands rallied in the streets. This was followed by a string of victories against oil and gas pipelines, coal mines and fossil fuel export infrastructure. Activists created an environment where virtually every major new fossil fuel project can be expected to meet organized resistance. The ripple effect from this movement reached all the way to the White House. During his last few years in office President Obama finally began prioritizing climate change, albeit at a time when Republican majorities in Congress made passing climate legislation impossible. Obama released a plan to regulate power plant carbon emissions under the EPA, and spearheaded a push to seal the world’s first truly global climate deal in Paris. But it wasn’t primarily lobby meetings with the president’s cabinet or members of Congress that produced this shift. The pressure came from people rowing kayaks out in front of Shell’s icebreaker and chaining themselves to bulldozers — in other words, from an increasingly bold and visible grassroots movement. A Trump presidency will certainly undo at least some of the progress made under Obama. The EPA’s Clean Power Plan is unlikely to move forward, and the Paris agreement is in jeopardy. But nothing Trump can do will change the existence of movements that are ready to challenge him at every turn. In fact, there is already evidence that the crisis caused by Trump’s election is inspiring a massive backlash from the left. On the night of Trump’s Electoral College victory, protests broke out in cities across the country. They only grew in the days after. The Saturday after the election, 8,000 people marched through the streets of Los Angeles to denounce Trump’s far-right agenda. That same day, 25,000 rallied outside Trump Tower in New York. Other major protests occurred in Portland, Denver, Seattle, Boston, Oakland, Indianapolis, and too many other towns and cities to name. The week after the election, thousands of students staged anti-Trump walkouts at high schools and colleges across the country. Perhaps only during the early days of the Iraq War has a president’s racist, militaristic, and anti-environment agenda received such direct and widespread protest in the 21st century. But Trump has managed to inspire this reaction before even taking office. And the spontaneity with which most of the protests came together says something about the urgency of the moment. “We never expected our event to be this big,” said Emily Nelsen, the initiator of a Love Trumps Hate rally in Seattle that drew thousands of people on Sunday. Nelsen, a graduate student studying Marriage and Family Therapy at Seattle Pacific University, organized the rally with a few friends, creating a Facebook event that soon received more than three 3,000 RSVPs. Like the Seattle event, most post-Election Day protests and rallies have ignited in direct response to the racism, misogyny and xenophobia of Trump’s campaign. This focus on solidarity with the groups most affected by Trump’s policies is only appropriate and as it should be. At the same time, the outbreak of protests shows how the larger left — including the climate movement — can effectively counter Trump’s agenda. Of course, Trump’s own statements belie Ryan’s words, and the threat of a Trump presidency means organizations all over the left will need to re-think their strategies. Once again, though, that will require learning from the past. After the collapse of national climate legislation in 2010, U.S. climate activists found new pressure points and built a movement that changed the conversation about fossil fuel infrastructure. Had the weak 2010 legislation become law, it’s entirely possible it would have produced a false sense of assurance that the federal government had everything in hand. The vibrant direct action movement we see today might never have taken shape. Today, the Trump election represents a challenge — not just to the climate movement, but to the whole left. We must build on the foundations laid by the movements for climate justice, migrant rights, racial justice and others these last few years. The onus is on us to make a new, multi-tiered movement larger than anything the United States has seen before. It’s a lofty goal, but there’s reason to think it might be possible. As almost anyone who has ever organized a rally knows, it is nearly unheard of to turn out thousands of people just by publishing a few posts on social media. Activists normally spend dozens of hours phone banking, writing action alert emails, and passing out flyers to get even a couple of hundred people to show up to an event. But the Trump election seems to be a “movement moment,” a threat that has grabbed the attention of so many people in such dramatic fashion that they are responding in ways they might not have considered previously. “It’s encouraging to see people who may not have ever gotten into the streets before starting to protest and take action,” Estelle said. The slow, plodding progress of EPA rulemaking under the Obama administration was never going to result in a movement moment — for climate activists or anyone else. And yet, it may turn out that street movements capable of changing politics as usual are more important than bureaucratic signatures when it comes to confronting climate change. None of this is to discount the very real dangers posed to the entire planet from a Trump presidency, or the tragedy of losing what small progress we’ve made on national climate policy. Nevertheless, if there’s hope for the climate movement under Trump, it might be found in the same kind of regrouping and shifting of strategies that occurred after the collapse of federal climate legislation. Of course, the challenges we face now are even greater than they were in 2010. But the existing movement with which we’re starting is much bigger and bolder, too. There have been numerous articles since the election by progressives about opposing Trump. I see no evidence of coordinated action to do this. So far just talk. Leadership is necessary. I don’t see any. Hope I am wrong.